You are invited to spend a magical time with us! Imagine spending your entire life living in a cave. Everything you've learned, everything you understand has been limited by stone walls, mathematical algorithms, and endless shadows. It's not a bad life, mind you. You have all you wish for to survive — fish and giant beetles to eat, medicinal glowing fungi, beautiful glittering crystals, and the shelter of the trees. The trees themselves were magical, dynamic organisms — always growing, always changing. It's a good life, as long as you avoided the brain jellies. Then imagine leaving this cave. You would be blinded by the dazzling light, for just a little while. Then, you would be able to see the rest of the world. You would witness humankind outside of the cave, and be able to sample many of the world's amazing things. However, you left the ones you loved behind. Would you go back? Would you take them with you, and show them everything that you have learned and experienced? More importantly, what would you do, if they decided to stay? ...what would they do to you? 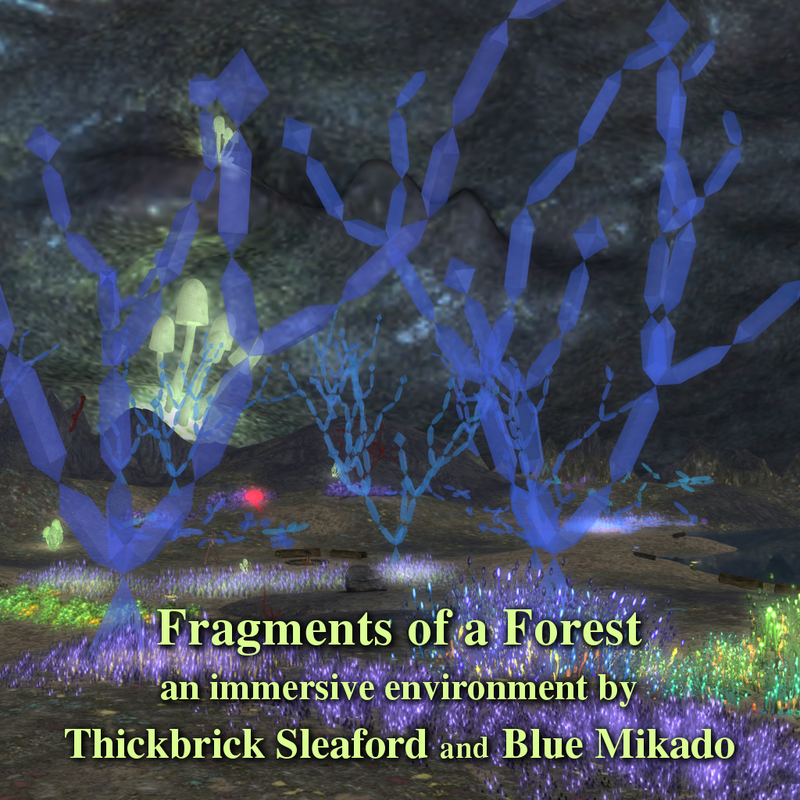 Welcome to Fragments of a Forest! Plato's Allegory of the Cave ( Plato's The Cave ) likened the journey of man's intellect to being chained within a dark cavern. Once a person is freed from their chains, they must undergo many stages of learning and unlearning before enlightenment. Then, once enlightened, Plato asked, "What would happen when we return to the cave?" Ours is a story about going back. Visit a world that has never existed before, and never will again. As you wander or sit and observe this world, it will change around you, driven by its own simple internal rules, producing very complex results. Find the glowing footprints throughout the sim, and touch them to learn of the cave's story. Explore the constantly changing forest, where each tree builds itself as a very simple fractal-like structure, with some randomness thrown in, and later seeds new trees around itself. Rest your body, let your mind wander, and observe the flying creatures above the lake, as they follow the rules of a simple algorithm to produce an intelligent-like behavior. This work will be open at the LEA 14 sim until the end of June 2017.